BackTrack is a very popular free Linux distribution that is commonly being used to hack into wireless networks by using Aircrack-ng to crack the WEP/WPA encryption. The reason why BackTrack is being used instead of Windows is because there are no patched drivers available for Windows that supports injection, unless you are willing to fork out $300 or $700 for an AirPcap TX/NX adapter. It is relatively easy to get BackTrack running by installing using UNetbootin and booting up the live version from USB but the most important thing is to make sure that your USB wireless adapter supports monitor mode and packet injection. If you’re looking to purchase a fully compatible plug and play USB wireless adapter that works really well with BackTrack 5, it can be tricky because some brands with the exact model can have a different chipset for different version numbers. For example, the TL-WN822N USB wireless adapter by TP-LINK comes with 3 versions. The version 1 uses two different chipsets, which is Atheros AR9170 and AR9102 while version 2 has the Atheros AR7010 and AR9287 chipsets, and the latest version 3 uses Realtek RTL8192CU. The chipset on a USB wireless adapter is the most important information but normally is not shown on the product box or even on the device itself. To help you in purchasing the correct adapter, here we list the safest USB wireless network adapter that we’ve tested to have the best plug and play compatibility with BackTrack 5, Kali Linux and Aircrack-ng. 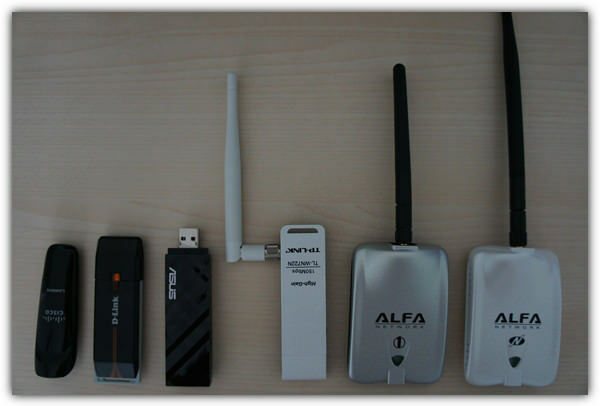 You can find a few online resources suggesting some USB wireless adapters that are compatible with BackTrack 5, but most of them are either outdated or simply recommend the Alfa AWUS036H which only supports B and G wireless standards but not N. We do not recommended to just blindly purchase any of the newer adapters released and sold by the manufacturers because most likely BackTrack 5 would not have the updated drivers to support it. After testing more than a dozen USB wireless network adapters, we found out that the 3 chipsets listed below are the most stable with BackTrack 5. You can click on the hyperlink to see the list of brands that use the chipset. Most of the wireless network adapters listed on the page from the hyperlink above were released a few years back making it difficult to purchase because manufacturers normally releases new products very frequently and phase out the old versions. After screening through the list, here are our recommended USB wireless adapters that have the best compatibility with BackTrack 5, Kali Linux and Aircrack-ng. Alfa prices were taken from Rokland Technologies, an official Alfa distributor in the USA while TP-LINK from Amazon.com. We’ve put some of the USB wireless adapters mentioned above to the tests to determine the signal performance and you can find the results on page 2. TP-LINK TL-WN722N have version 3 and 4 that is using Realtek chipset but not Atheros. So be careful when you buy the adapter. TP LINK USB WIFI adapter TL-WN7200ND Or Prolink PAN2001 Support compatibility with BackTrack 5, Kali Linux andAircrack-ng. The Alfa website has the following note: AWUS036NHR can not use the driver of the AWUS036NHRV.2 This article was recently updated. Is the unit mentioned the v 2? TRENDnet presented: The 108Mbps 802.11g Higher power Wi-Fi USB 2.0 Adapter means that you can link wirelessly in greater selection in addition to overall performance. This product characteristics WEP in addition to WPA encryption in addition to IEEE 802.1x consumer assist regarding guaranteed wi-fi data indication. This specific 802.11g product easily joins on your wi-fi community with no overall performance degradation. With the imminent arrival of Kali 2.0, hopefully compatibility will increase a little. My ALFA AWUS036NEH has drifted into and out of compatibility when customising transmit power to Bolivian Regulatory Domain (30dBm 1000mW). That doesn’t mean it’s a bad WiFi Adapter, it just means that support on the OS level might not nessisarily be 100% for that particular model adapter. Everything else still works fine like; Internet Connectivity, Packet Injection & Promiscuous Mode. Hopefully my woes are sorted out on August 11th! (Kali 2.0 Release Date). Can you test Kasens N9600 with 80dBi antenna? it seems to have Ralink 3070 inside and should work with kali linux. I have it, works fine. Quite the good range. BUT, you need to install the VMbox extension pack if you are using it as guest OS. – using kali linux 2.0 in VMbox and Windows 8 as host. Backtrack 5R3 was discontinued in April of 2013. That means all support, including updates, was stopped for that version. i m using TP-Link TL-WN7200ND wireless adapter. will broadcom 4313 – 802.11 b/g/n work with aircrack-ng, backtrack, kali-linux? I ordered TP-LINK TL-WN722N without any second thought. the reviews were so affirmative that i couldn’t resist buying. will be shipped by tomorrow noon. cost was US$13…hahaha yup,so cheap. Even I am planning to order the same one but just a quick confirmation. Is it compatible with backtrack 5 R3? or now AWUS036NHR is now supported by backtrack, or is it possible to get it to work as effectively as the older AWUS036NH ? Hey Raymond, You have given such a valuable information to us. So thanks a lot..
After going through your comparisons, I am confused about between ALFA’s AWUS036H & AWUS036NH. Which adapter should I choose? On the Basis of both backtrack use and As a normal wifi card for using wifi. Tplink TL-WN722N using atheros AR9285 chipset is compatible with backtrack 5. I also used it on kali1 3.12 kernel-1.05.it works right out of the box using atk9(forget driver name or module).It serves and still serving me very good, those who are willing to buy you can without any discomfort. Which is most comfortable to kali linux? Nice methodology and very valuble information. Thanks much. Raymond is the tp-link adapter compatible with backtrack 5? Also is it compatible with ubuntu 12.04? 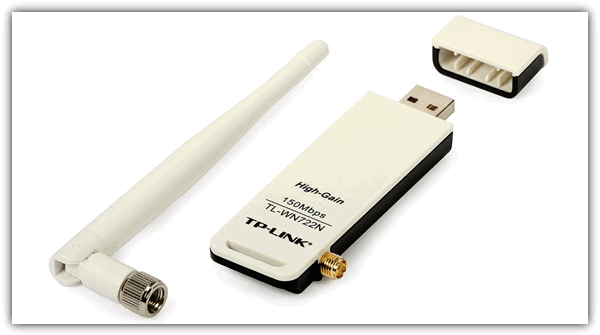 Hi, I use the high power wireless usb adapter TP-Link (model TL-WN7200ND). I have tested this adaptor with backtrack 5 Gnome,BT5-KDE and even with Kali i can’t get backtrack not started. Is it possible that my adaptor is protected so i can’t crack wep, wpa2 networks??? Which adaptor would you best recommend? It would be wonderful if you add AWUS036NH to your chart an comparisons. First, I have a small factual correction to make for this article — the RT3070 chipset is made by Ralink, not Realtek. And it’s a very good chipset. I have the RT3070 chipset in my Alfa UBDo external wifi adapter and it works excellent with 2000 mW power and covers the N protocol as well. But the UBDo is an omni-directional antenna and my attempts to get into my local city’s public wifi system were marginal (sometimes yes, for a little while, and sometimes no). So I bought an Alfa AWUS036NHR and an 18 dBi yagi antenna. The NHR model uses the Realtek 8188ru chipset (and the rtl8192cu driver in Linux). The unit functions perfectly good with Windows XP,. so I know there’s no physical problem with the unit, and I know that the Windows driver works correctly in normal client usage. But there are lots of problems using this under Linux. Under Linux the monitor mode won’t support channel changing. It’s stuck on channel 1. So Kismet (my packet sniffer) won’t work correctly. I don’t know about injecting packets since I’ve never tried that. Even under normal client usage mode it won’t lock up on APs that are fairly strong and steady under Windows. It acts like it’s always on low power or something. The Realtek utility software in Windows has a selection box for three power modes. I haven’t found any commands to access those modes in Linux yet, if the driver even supports power changing. I have searched the net and downloaded the newest drivers with patches that I could find. The latest mod date that I’ve tried is Feb 2013. And it still doesn’t make any difference. I might have to buy another adapter and keep this one around until someone gets the Realtek 8192cu driver situation figured out for the 8188ru chipset. That’s not a problem with the card. If you’re using Kali linux, it’s a known bug. It can be fixed. Do this: ifconfig wlan* down. macchanger -r wlan*. ifconfig wlan* up. airmon-ng start wlan*. After all of that you should be good to go. Best of luck to you. Great article! Thanks for all the images, charts, and details. I just purchased the TL-WN722N from Amazon. It arrived today. Hi ! is Alfa AWUS036NH compatible with BT 5 r3 ? 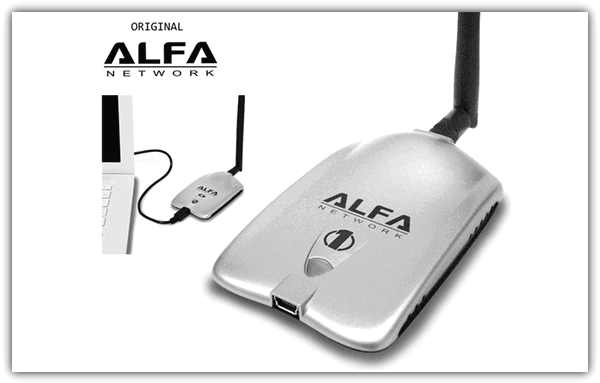 Hi Mounir, yes the Alfa AWUS036NH is using RT3070 chipset and is compatible with BackTrack 5 R3. I personally would say that it is a good one but not the best. Unfortunately not. I have tested AWUS036NH in BT 5r3 and card have problems with injection. I don;t received replies from AP. Tested many times with almost all BackTrack releases. So if you would like to monitor, dump, save packets and then crack it, it will be fine. BT 5r3 known this card just plug and play. But injection problem can be solved only maybe with Linux guru. My friend is using it for more than four years very good device. We use this device in university and it catch good signal from over radio access point. He got it from Saudi. I have owned this adapter for years now. It is very dependable and powerful. I have three and two have been in use constantly 24/7 for over two years. At 500mw they work great for packet injection or as a simple wireless adapter. Windows 7 now includes generic drivers for it. If you want to use aircrack with something that is not as heavy as Backtrack, try Slitaz-aircrack-ng.